La Liga chiefs will arrive in Nigeria on Monday for a bilateral meeting with the League Management Company (LMC) to finalize discussions on collaboration between the two leagues which began during a similar visit by the LMC to Spain earlier this year. 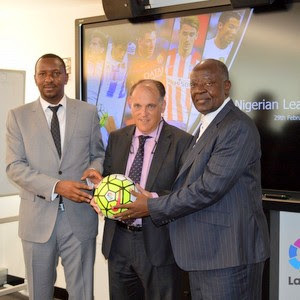 The LMC chairman, Shehu Dikko, and Nduka Irabor, the Chief Executive Officer, were in Madrid, Spain, from February 29 to March 1 for follow-up talks with the La Liga initiated when both Leagues met at the Forum of World Leagues in Germany. The La Liga delegation will be led by the President, Javier Tebas, International Advisor, Melcior Solar, Head of La Liga South Africa, Antonia Barradas and Fernando Sanz, the Head of La Liga Middle East office and who is in charge of African affairs. The two bodies are expected to sign a memorandum of understanding for a partnership that will cover exchange of knowledge, trainings for Nigeria Professional Football League (NPFL) club coaches and administrators, La Liga and NPFL clubs’ exchanges, marketing, commercial, promotional activities and Youth development. Dikko said the visit is a landmark for the NPFL as it will be a culmination of strategies for extensive and wholesome development of the league. “As a developing league, we have continuously sought collaborations with some of the global model league management and La Liga is the first of such coming into fruition. There are several benefits that will accrue from this relationship and we intend to tap deeply into their over 25 years of experience of commercialization of football”, said the LMC chairman. The delegation, which will arrive in Abuja on Monday, will pay a courtesy visit to the sports minister Solomon Dalung and the Spanish Ambassador to Nigeria; will also undertake a tour of the Abuja National Stadium. “The formal unveiling of the partnership between the NPFL and La Liga will hold on Tuesday while we would create opportunity for stakeholders to interact with the delegation at some point during the day", Dikko further disclosed.